The Dexter Tigers golf team faced off against Greenville and Orono. The Tigers came in third place with a score of 231. Matt Sickles shot with a score of 50. Katelynn Babine shot with a score of 59. Trevyn Sinclair shot with a score of 60. Caitlyn Chabot shot with 62. Lastly, Nick Toland shot with a score of 72. Greenville had a total score of 228. Orono had the game-winning score of 188. The medalist of the match was Jason DeSisto of Orono with a score of 44. The Dexter Tigers golf team played against Old town and Mattanawcook. The Tigers came in third place with a score of 238. Both Matt Sickles and Trevyn Sinclair shot a 54. Jacob Cardelli shot with a score of 63. Katelynn Babine shot with a score of 67. Nick Toland shot with a score of 68, and Caitlyn Chabot shot with a score of 71. Old Town and Mattanawcook each had a score of 193, but it was Old Town who came out on top via tiebreaker. The medalist of the match was Max Woodman of Mattanawcook with a score of 39. The Dexter Tigers golf team traveled to Cline Hall to face off against John Baptist, and Ellsworth. The Tigers came in last place with a score of 218. Matt Sickles shot with a score of 48. Trevyn Sinclair shot with a score of 52. Jacob Cardelli shot with a score of 53. Katelynn Babine shot with a score of 65. Nick Toland shot with a score of 66. Lastly, Caitlyn Chabot shot with a score of 68. Ellsworth had a total score of 185 and John Baptist shot with a score of 173. The medalist of the game was Jerry Huang of John Baptist who shot a 41. 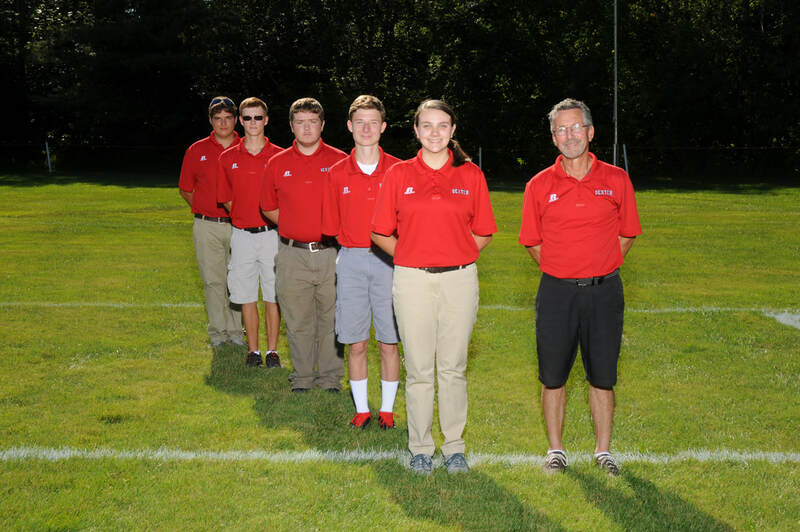 The Dexter Tigers golf team played at home against Orono, and John Baptist. Dexter Came in third with a score of 222. Matt Sickles shot with a score of 47, both Trevyn Sinclair and Jacob Cardelli shot with a score of 55. Caitlyn Chabot shot with a score of 65. Katelynn Bamine shot a score of 71. Finally, Nick Toland shot with a score of 72. Orono had a total score of 202. John Baptist had a score 195. The medalist of the match was Jason DeSisto who shot a 46. The Dexter golf team traveled to Orono to take on Orono, Greenville, and Houlton. Dexter finished in third with a score of 230. Trevyn Sinclair shot a 51, Matt Sickles shot a 55, Jacob Cardelli shot a 61, Nick Toland shot a 63, Caitlyn Chabot shot a 72 And Katelynn Babine shot a game high 80. Houlton won the game with a score of 165 as they also had Wyatt Harvey, the medalist for lowest score as he shot a 38. Greenville had the highest score of the game with 241. Dexter played at home against PVHS and Foxcroft. Dexter won the match with a score of 219. Jacob Cardelli shot a team-low of 50, Matt Sickles shot a 53, Trevyn Sinclair shot a 55, Caitlyn Chabot shot a 61, Nick Toland shot a 67, and Katelynn Babine shot a 69. Rivals Foxcroft came in second with a score of 234 and PVHS came in last with a score of 263. The medalist for this match was Ethan Curtis who had a score of 47. Dexter played Old Town, John Bapst, and Mattanawcook. Dexter finished last once again with a score of 220. Matt Sickles shot a team-low with a 50. Trevyn Sinclair had a score of 51, Jacob Cardelli with a score of 56, Nick Toland had a score of 63, Caitlyn Chabot had a score of 64, and Katelynn Babine had a score of 67. John Bapst won the game by one stroke over Mattanawcook with a score of 181. Max Woodman of Mattanawcook won the metal for lowest score of 40. Dexter traveled to Hidden Meadows to face off against Old town, and Houlton. Dexter finished in last with a score of 218. Matt Sickles shot a 43. Jacob Cardelli shot a 50. Nick Toland shot a 62. Caitlyn Chabot shot a 63. Katelynn Babine shot a 64. Lastly, Trevyn Sinclair shot a 65. In second, with a total score of 198 was Old Town. Coming in first was Houlton with a score of 172. Dexter played another match in Greenville. Dexter took on Oreno, John Bapst, and Ellsworth that had Dexter coming in last place with a score of 229. Once again Matt sickles led the team with a score of 44, In second, was Jacob Cardelli with a score of 50, third was Nick Toland whose score was 62, next, was Caitlyn Chabot who shot a 63. Second to last, was Trevyn Sinclair who shot a 65, Finally, Katelynn Babine had a final score of 67. The Dexter golf team traveled to Sorrento to take on Sumner, PVHS, and Calais. Dexter came in third place with a score of 237. The leader of the match for Dexter was Matt Sickles who shot a 53. Trevyn Sinclair shot a 54. Jacob Cardelli shot a 62, Nick Toland shot a 68, Caitlyn Chabot shot a 70 and Katelynn Babine shot a 93. Dexter, along with three other teams, went up to Greenville for a golf match. Joining Dexter was Bucksport, Howland and the home team Greenville. For Dexter, Lucas Qualey ended with a score of 50 on nine holes. Matt Sickles ended with a 61. Jacob Cardelli ended with a 63. Treven Sinclair ended with a score of 66. Ethan Boutilier ended with a 70. Dexter, along with three other teams, went up to Foxcroft for a golf match. Joining Dexter was Mattanawcook, Greenville and the home team Foxcroft. For Dexter, Matt Sickles ended with a score of 48 on nine holes. Lucas Qualey ended with a 52. Jacob Cardelli ended with a 67. Treven Sinclair ended with a score of 63. Elise Beaudry ended with a 59. Dexter, along with three other teams, went up to Blink Bonnie Golf Course for a golf match. Joining Dexter was Hermon, John Bapst and the home team Sumner. For Dexter, Matt Sickles ended with a score of 53 on nine holes. Lucas Qualey ended with a 56. Jacob Cardelli ended with a 59. Treven Sinclair ended with a score of 67. Elise Beaudry ended with a 66. Ethan Boutilier ended with a 67. Dexter’s golf match that was planned for September 1, 2017 in Sumner was canceled. Dexter with Hermon and Old Town went to Hermon Meadows Golf Course for a golf match. For Dexter Matt Sickles had a score of 62 for 9 holes. Treven Sinclair ended with a score of 63 and Jacob Cardelli ended with a 66. Dexter’s golf match that was planned for September 6, 2017 in Dexter was canceled. Dexter went to Bucksport for a match against Bucksport. Matt Sickles ended with a score of 58 for 9 holes. Treven Sinclair ended with a score of 73 and Elise Beaudry finished with a 66. Dexter had a home golf match with Sumner and Jonh Bapst. Matt Sickles ended with a score of 46 on 9 holes. Lucas Qualey ended with a score of 60. Treven Sinclair ended with a 68 and Elise Beaudry ended with a 70.